Support for both SAS and SATA drives. Backwards compatible with 3GB/s SATA and SAS devices. Direct-attach SAS and SATA hard disk drives. Up to 6Gb/s per SAS port data transfer rates. Extensive support includes: Microsoft Windows Server, Windows Vista, Windows XP, Linux and more. Manufacturer: Dell. Condition: New Fully Tested. Pulled from working machines, tested, cleaned. Storage Connectivity; Data Transfer Rates 8 ports; 6Gb/s SAS 2.0 compliant. Integrated RAID (IR):NO- RAID. SAS Bandwidth:600 MB/s per lane. PCI Data Burst Transfer Rates:X8, PCIe 4000 MB/s. PCI Card Type:3.3 V Add-in Card. Manufacturer: Adaptec. 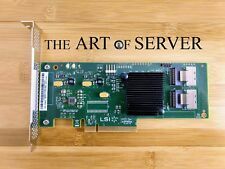 Ideal for entry-level server to high-end server platforms and high-performance workstations without compromising robust 6Gb/s performance and proven Adaptec reliability. • Adaptec maxView Storage Manager. 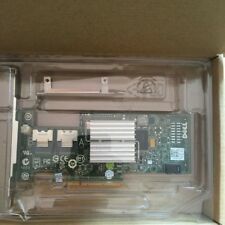 Includes: LSI SAS9207-8E Host Bus Adapter. Manufacturer: LSI. Tested for Key Functions, R2/Ready for resale. Condition: Used, from a working machine and tested to work great, in great condition. Tested for Key Functions, R2/Ready for Resale. 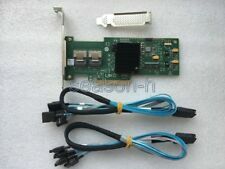 New LSI 9205-8i SAS SATA 8-port PCI-E 6Gb RAID Card. We will send you a new one after receiving the default item. This is already the IT model. I have fully tested them using all 8 SAS lanes. I've used ZFS for many years. I'm familiar with ZFS on Linux, FreeNAS, and many of the technologies commonly used by other enthusiasts. They have been cross-flashed to Avago / LSI 9207-8i IT (Initiator Target) firmware version P20 (specifically 20.00.07.00). Type: LSI SAS 9201-8i SAS2008-IT. 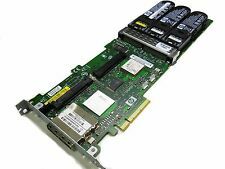 1x LSI SAS 9201-8i RAID Card. SAS Bandwidth:Half duplex,(x8 wide bus)9600MB/S. PCI Power(Nominal): 7W. Original LSI Molex Mini SAS 36Pin SFF-8087 to 4x SFF-8482 SAS cable - 1M/3Ft. This is 256MB Cache card. Original Amphenol Mini SAS 36Pin SFF-8087 to 4x 7Pin SATA Fan-out cable with SGPIO - 70CM. Need to connect more hard drives?. We will send you a new one after receiving the default item. Supports RAID levels 0, 1, 10 (RAID levels 5 and 50 with optional ServeRAID M1000 Series Advanced Feature Key). Supports SAS and SATA drives. 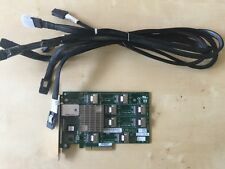 Connects to up to 16 SAS or SATA drives. We keep our promises that we will provide you with the best solution within 24 hours. 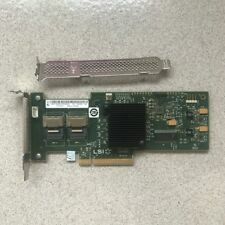 Listed for sale here is an IBM SAS-2 Expander daughter card adapter, part number 46M0997. These units have been updated to firmware version 634A. I've helped many friends and strangers with their servers. No accessories included, boards only. Dell pn TFJRW. LOW PROFILE. ● OS Support: Microsoft Windows, Linux (SuSE, Red Hat), Solaris, VMware, FreeBSD See the downloads page for details on versions The HBA supports Solaris 10 and Oracle® provides a built in driver; installation of an LSI driver is not required. 8 internal 6Gb/s SAS SATA ports. 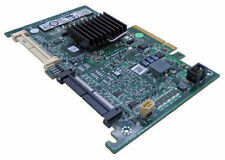 Supports up to 256 SAS or SATA end devices. Provides internal connectivity in a low profile form factor. Low profile form factor design. Two x4 internal mini-SAS connectors (SFF8087). Trending at $57.88eBay determines this price through a machine learned model of the product's sale prices within the last 90 days. Reference the RMA number outside of box. System Boards. Check parts for our serial numbers before sending back. The RMA number must be referenced on the airway-bill, otherwise you may incur delays. Manufacturer Dell. I've used ZFS for many years. I'm familiar with ZFS on Linux, FreeNAS, and many of the technologies commonly used by other enthusiasts. 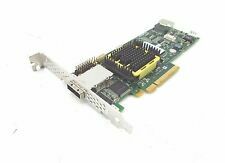 Listed for sale is LSI 9201-16E 16-lane external SAS host bus adapter card that I flashed to IT mode firmware for use with ZFS. Manufacturer ADAPTEC. Type: SAS/ SATA. Bracket: High Profile Bracket (We also have low profile bracket. Let us know if you need them with low profile bracket instead). Check parts for our serial numbers before sending back. Works in R710 internal storage slot. I have fully tested them using all 8 SAS lanes. I've used ZFS for many years. I'm familiar with ZFS on Linux, FreeNAS, and many of the technologies commonly used by other enthusiasts. External Port(s) x1 External SAS. Channel Quantity 8. Battery Included(YES/NO) Yes. Part Number 487738-001. Graphics Cards. RAID Cards. Hard Drives. Drivers Included No. Switch (38). Hard Drive (10). Tape Drive (2). 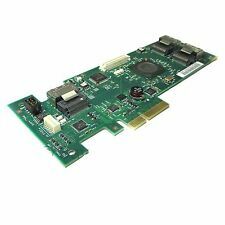 1x HP 717708-001 2-Port Adapter Card w/ Full Height Bracket ' Previously Owned. Add to Favorites. PREVIOUSLY OWNED, TESTED FOR KEY FUNCTIONS = Tested for Key Functions, R2/Ready for Resale. Ideal for entry-level server to high-end server platforms and high-performance workstations without compromising robust 6Gb/s performance and proven Adaptec reliability. • Adaptec maxView Storage Manager. Unit is in good working condition. It's made to last and it's truly the largest difference between the stuff you "can get" and the stuff you must have to change the way you compute. All special request orders that have been approved must be arranged. 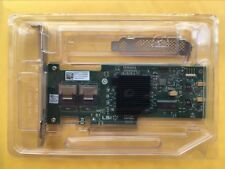 This raid card includes the cache card and SAS cable. Add to Favorites. Condition Used. Once an order has been paid, we will test the server and apply any BIOS updates necessary. Storage Works / Storage. It is our goal to help you in every step of purchasing a server from us. Helpful Links.